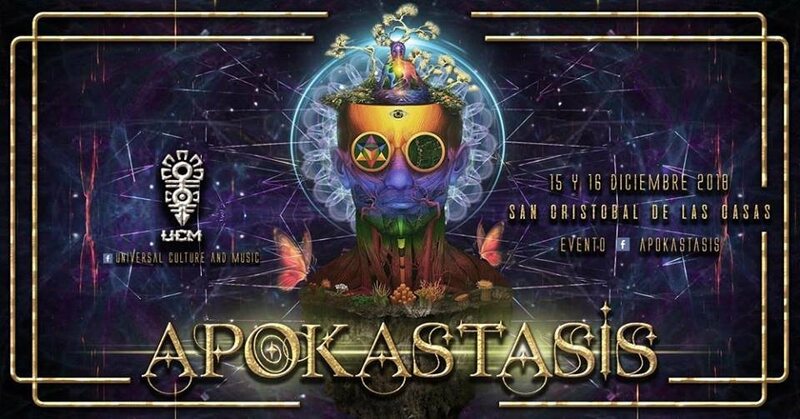 Welcome to the event where the musical frequencies become high mental stimuli that harmonized with the psicovisionarios scenarios and the extraordinary works of the talents @ s artists will give life to ♫♫ Apokastasis ♫♫. We are convinced that Universal Culture and Music has to maintain the concept that characterizes the collective; having firm the ideology of bringing together the best musical, artistic exponents, as well as any form of biopsychocultural expression. Our diffusion of unity and respect is open to anyone who wishes to experience with all positive energies the feeling of connecting the essence of Mother Nature's love with the inner energetic balance. In response to the support and grateful for the good vibes, we improved the context of our events by inviting experienced producers and painters (plastic arts). Thus we will offer the ideal environment for psychodelic culture. This meeting will be a Festival of Music, Art and Psychedelic Culture, born with the idea of ​​generating more spaces and musical experiences in the open air, accompanied by food area, healing area, yoga and therapies, decoration, workshops, dance, hula hoops , juggling and performance, Mapping Art, circus interventions, among many others. ► •٠ •● GOA B. ●••٠ - Solar System.